Hi all. I want to share you my infographics showing how dispersion and sigma works. I put these into Public Domain so please feel free to use them anywhere. Let me know if you have a reviewer's comment. Fig. 1. 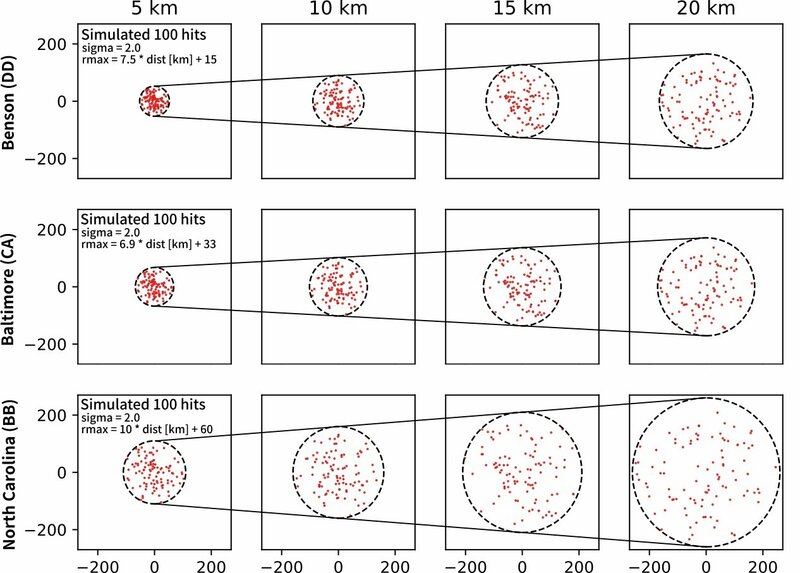 The relationships between the maximum horizontal dispersion radius, firing range, and ship types. Note that vertical dispersion is NOT considered in this figure and onwards. Fig. 2. The concept of sigmas. Fig. 3. 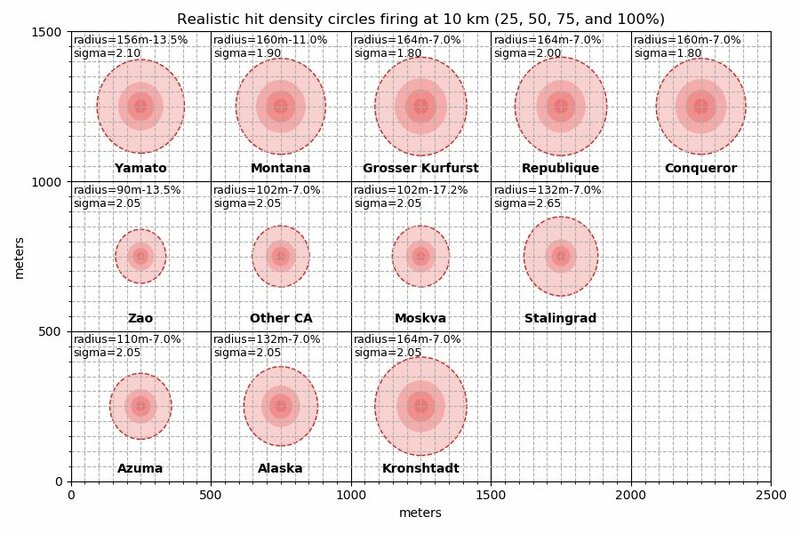 The "realistic" comparison of 25, 50, 75, and 100% hit probability density circles in T9~10 CAs and BBs firing at 10 km distance. 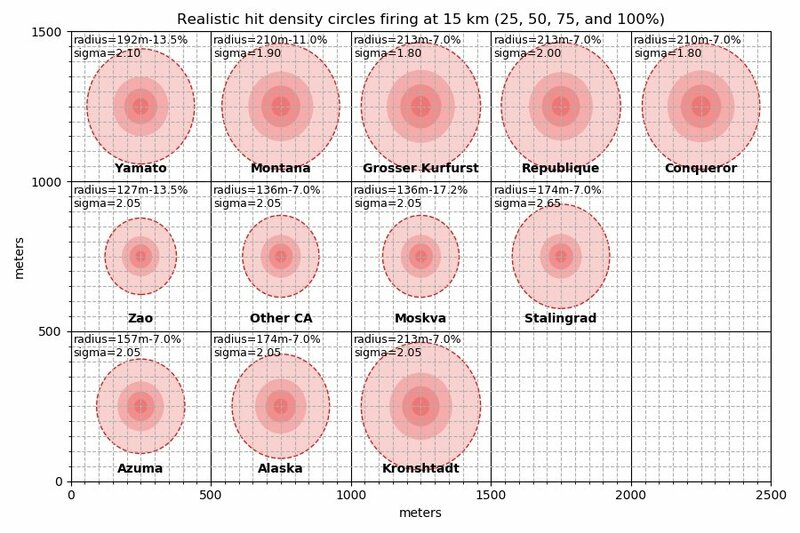 Aiming Systems Modification 1, Artillery Plotting Room Modification 2, and the special upgrades for Yamato, Zao, and Moskva are considered to calculate the maximum dispersion radius. 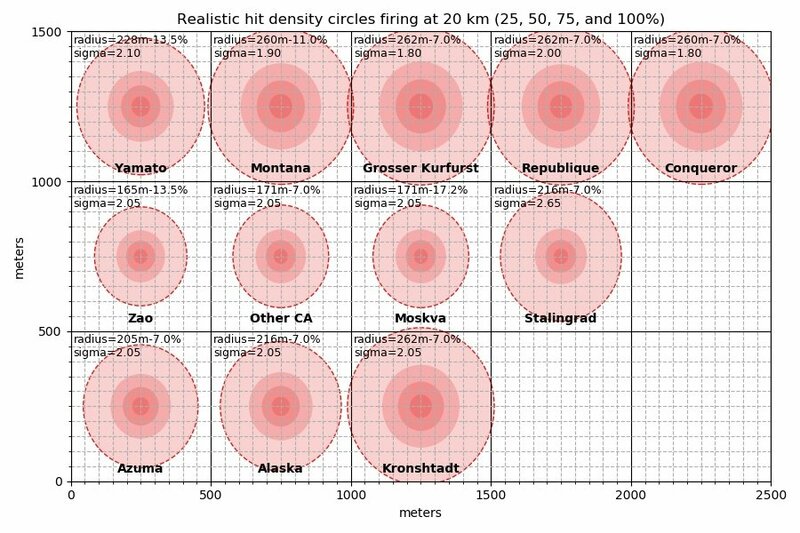 Note that each 0.1 increase of sigma approximately results -4% decrease in the radius of 50% probability circles. Fig. 4. Same as Fig. 3 but firing at 15 km distance. Stalingrad is ruining everything. Fig. 5. Same as Fig. 3 but firing at 20 km distance. Most of these may go over my head like a badly aimed main gun shell from Gneisenau from 19km. This somehow reminds of the initial stats of Iulius Caesar (Or ingame known as Italian BB Giulio Cesare). The players were vocal in Dev Blog over the really tight dispersion circle/elipse at max gun range (cruiser-level of dispersion elipse) despite the meager 1.5 sigma. It was reasonable concern because dispersion elipse is much more important than sigma. If a ship has a small elipse at all range, sigma value can be quite irrelevant. Because sigma is, after all, probability. Just remember, sigma is another name for standard deviation. Dispersion is the area your shots will likely endup. Sigma is the likelihood of your shots sticking close to the centre. Naval gun disperson are usually not a circle, due to left right angular control is easier than speed variance, elevation angle variance, ship body horizontal stability, such that variance in shell travel distance is usually greater than left right variance. This dispersion pattern was also one of reason for the crossing the T.
That is why I summarise the effectiveness of a ship's guns as: "CAN IT ACTUALLY HIT AND DAMAGE SOMETHING?" because it takes into account of dispersion, sigma, velocity, penetration, RoF, etc. No need for fancy mumbo jumbo. Good sigmas are useless if your dispersion is huge because your centre is going to be proportionally larger. 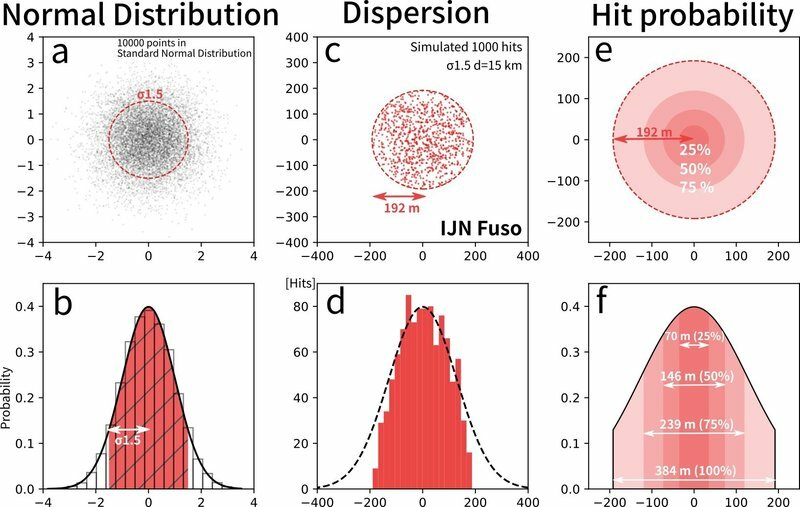 Lousy sigmas are still good if your dispersion is small because although you will not hit things in the middle, you still can hit things if the entire target is in your dispersion area. For me, wg is making a game more complicated than necessarily for something that most people just want to point and shoot. If I wanted that much physics, I would be playing KSP. Oh wait. I AM. Naval gun disperson are usually not a circle, due to left right angular control is easier than speed variance, elevation angle variance, ship body horizontal stability, such that varioance in longative distance is usually greater than left right. Yes. That's why I wrote that vertical dispersion is NOT considered. Even in this game, the model is very complicated and not fully understood as far as I know. 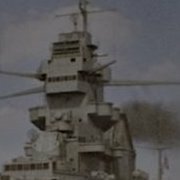 IJN BBs are officially confirmed that they have larger vertical dispersion. 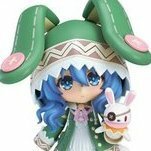 This thread provides some information. However, there are little differences in its parameters between the ships and hence it is most likely insignificant for anyone comparing ships.